Donatello is sometimes credited with introducing spiritelli into renaiassance art. As we have seen, they were around before Donatello, but Donatello transformed them into something quite new. 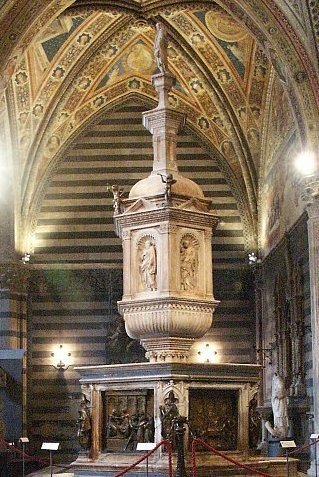 This is the font in the baptistery at Siena, dating from around 1417. The font itself was designed by Jacopo della Quercia, the sculptor who designed the tomb of Ilaria del Carretto we met on the previous page. 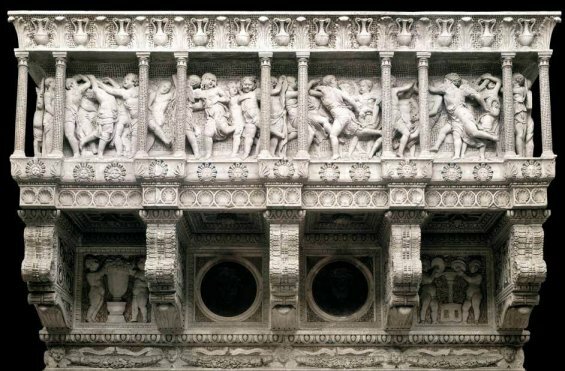 Donatello's contribution was the musical spiritelli, shown in detail below. Those rather bland little figures from the sarcophagi have suddenly come to life, dancing and playing instruments, moving the spiritelli away from a focus on death, and widening the religious context. 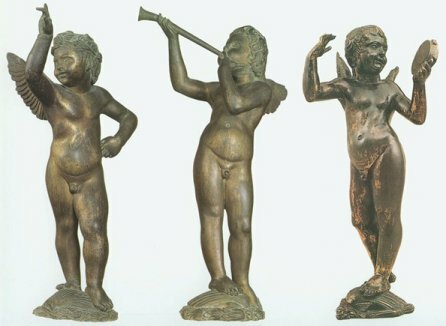 'Musical putti' by Donatello, here and in the Duomo in Florence, became a familiar component of religious art from here onwards. 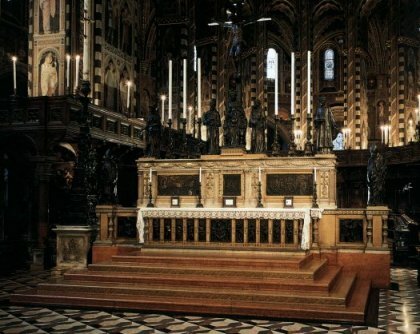 in 1439, Donatello completed his cantoria (choir gallery) for the Duomo in Florence. In 1435 the Spiritelli appeared on top of an even more sacred subject. 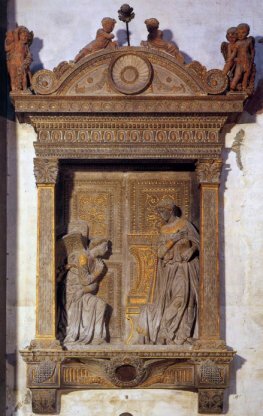 This is The Annunciation, on the Cavalcanti altar, in Santa Croce, Florence. 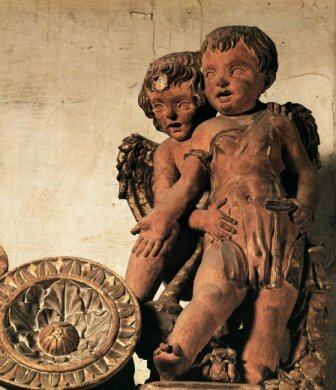 Vasari's comments on these putti are interesting: 'For fear of height one clasps the other in his embrace so as to reassure one another. ' (Donatello) shows great art and ingenuity in the figure of the Virgin, who, frightened by the unexpected appearance of the angel, timidly and sweetly adjusts her person into an honorable reverence, and turns with beautiful grace towards him who salutes her'. In one respect, Vasari gets it wrong: it is not the appearance of the angel that startles the Virgin, but his words: Hail, thou that art highly favoured, the Lord is with thee: Blessed art thou among women'. The role of the spiritelli is complex. Humour is part of the story, but also the idea that Spiritelli charge humans with emotions, in this case, fear. I would add one further thought. The message of the angel is that the Virgin will give birth to a child: could it be that these figures prefigure the familiar image of the Virgin and child? One more work by Donatello. We're now off to Padua, and the basilica of San Antonio. The row of musical angels running along the main altar date from 1447 - 1450. 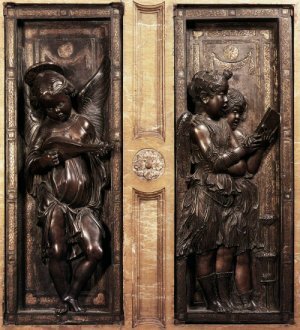 Significantly, Donatello's contract for this work does not use the word spiritelli, but Angeli.